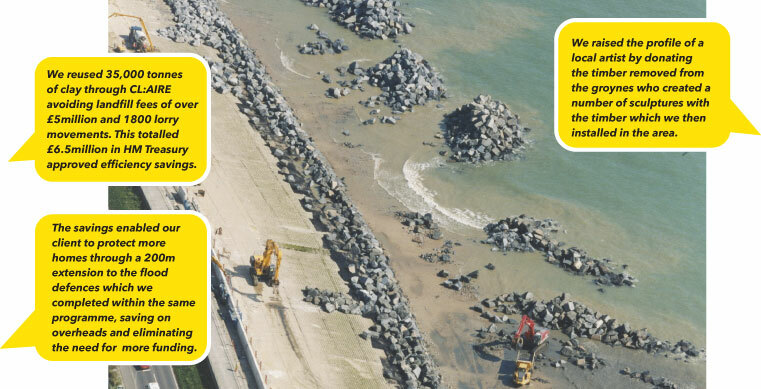 Mackley & Van Oord (TVO) completed a 2.4km coastal defence scheme near Camber in East Sussex. The aim was to improve the standard of the sea defence with a concrete wave wall and rock revetment, increasing flood protection from one in 20 years to one in 200 years. The scheme needed to allow for climate change and changes in predicted tide levels. Not only was this project hugely beneficial to our planet, but our innovation, design and technology led to economic growth all round. Our client, the government, local residents, regional businesses and us! We reused 35,000 tonnes of clay through CL:AIRE avoiding landfill fees of over £5million and 1,800 lorry movements. This totalled £6.5million in HM Treasury approved efficiency savings. The clay was sent to a nearby housing development for reuse. The savings enabled our client to protect more homes through a 200m extension to the flood defences which we completed within the same programme, saving on overheads and eliminating the need for more funding. We further saved our client money by amending the design for the car park using sheeters to support the concrete wall. This gave the same desired effect but with fewer costs involved. We raised the profile of a local artist by donating the timber removed from the groynes who created a number of sculptures with the timber which we then installed in the area. We have an established network of SMEs, specialist suppliers in the Southeast, supporting local and regional businesses. This scheme utilized a number of our supply chain, with whom we share our sustainability best practices. We replaced the concrete steps with timber steps which saved 840 tonnes of CO2 emissions.